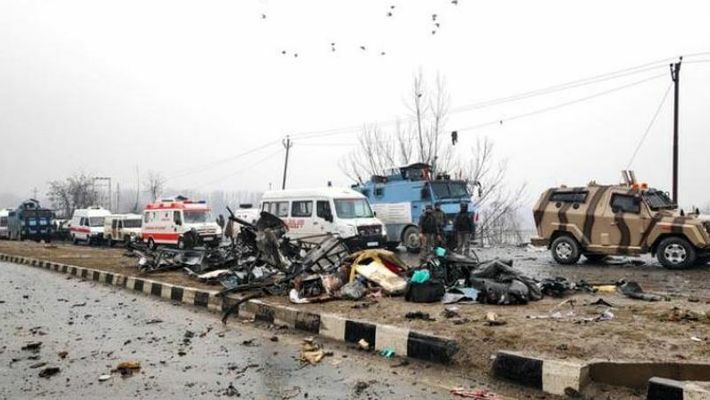 New Delhi: The Central Reserve Police Force (CRPF) that has lost more than 40 jawans in the Pulwama terror attack of Thursday is now struggling to identify the bodies of its personnel. Sources in Jammu and Kashmir claim that some bodies have been damaged so badly that it is almost impossible to hand the mortal remains over to the respective families. The CRPF has prepared state-wise data of jawans travelling by the bus that was attacked by Jaish-e-Mohammed terrorists. Meanwhile, date-wise data prepared by the CRPF show that the jawans who have laid down their lives in the line of duty hailed mostly from Uttar Pradesh, followed by Rajasthan and Punjab. According to the data, 12 of the jawans were from Uttar Pradesh, five from Rajasthan and four from Punjab. One person identified as Naseer Ahmed was from Jammu and Kashmir’s Rajouri area. The families of the martyrs have been informed of the casualties, sources confirmed. The data also say that maximum jawans who were travelling by the bus were from 115 Battalion, 76 Battalion and 82 Battalion of the CRPF. The CRPF is probing whether there was any violation of the standard operating procedure (SOP) during the movement of the convoy. According to the SOP, without the permission of the commanding officer who is normally of the rank of assistant commandant, no jawan can deboard the bus. Another SOP holds that buses or any car in the cavalcade cannot stop at any point of time. Further, it is the duty of local police to sanitise the route and ensure that no public vehicle enters or breaks the cavalcade — goes the SOP. In this particular attack, it was the failure of the local police that a private vehicle hit the bus that killed more than 40 jawans. Sources have confirmed that jawans who were securing the cavalcade got injured due to the impact of the IED blast. Security forces and local police expect that more than 150 kg IED was used by the suicide bomber Adil Ahmed Dar. According to a senior CRPF officer, this cavalcade had almost 2,500 jawans.